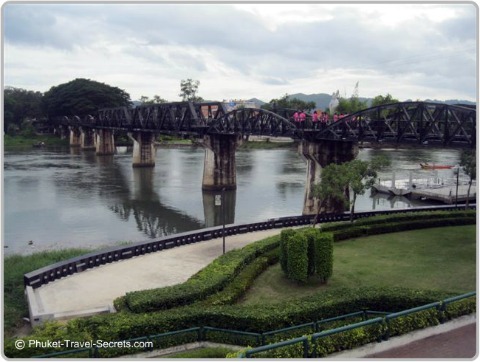 The Bridge on the River Kwai is just one of many historical sites and attractions that inspired us to visit Kanchanaburi Province in Western Thailand. The area surrounding the Bridge on the River Kwai can at times be extremely busy, so if your after that perfect picture walking across the infamous Bridge you will have to get there early to beat the crowds. To fully appreciate the historical sites in Kanchanaburi and surrounding areas it is worth reading up about the history and learn of the horrible atrocities that were carried out during World War 2 and the building of the Death Railway and the Bridge on the River Kwai before you go. Both the Death Railway and the Bridge on the River Kwai are amazing constructions that were built during extremely difficult times. Today parts of the Death Railway and the Bridge on the River Kwai are operational and you can take a train ride along the historical and very scenic route from Kanchanaburi. 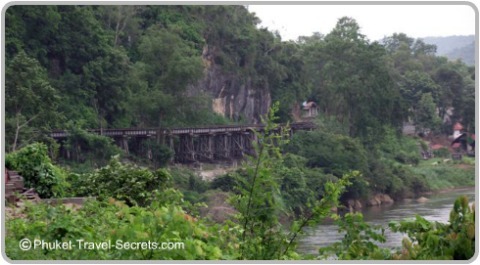 The train ride will take you across the amazing Wang Pho Viaduct, a wooden lattice structure built by POW’s on the side of a steep cliff over the banks of the River Kwai Noi. 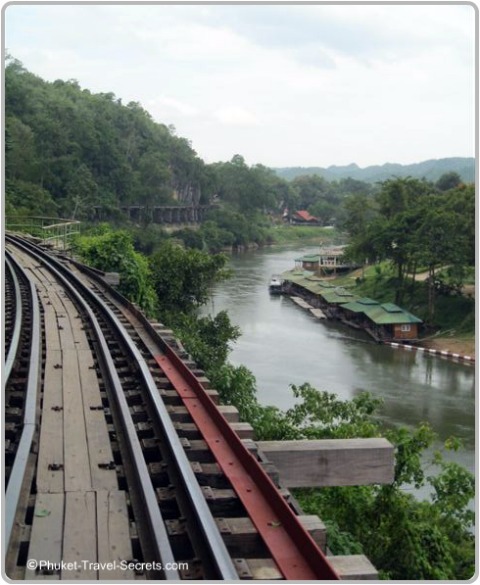 This section of the Death Railway offers some of the most spectacular views of the river Kwai below. Near Wang Pho Viaduct is Tham Krasae Railway Station and close by is the Krasae Cave; the cave is rather big and is home to a large Golden Buddha statue. From the Krasae Cave you can walk across Wang Pho Viaduct, but before you do check what time the next train is due. I opted out of this as I am petrified of heights, but Jeff and the two kids were extremely keen to make the walk across. Just beware that some of the timbers on the track are in need of some repair. 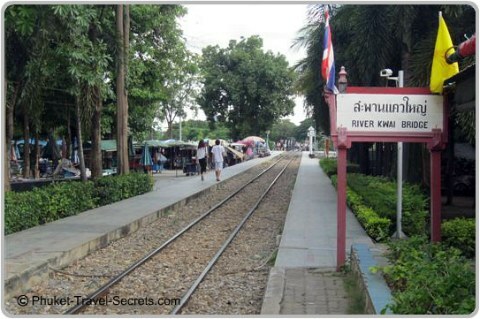 The train terminates at Nam Tok Railway Station, where you will find some great places to eat near the station. 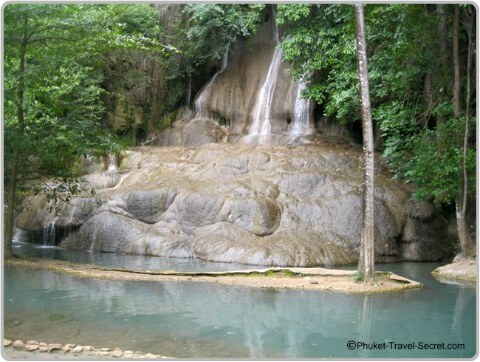 From here you can either walk or take local transport to Sai Yok Noi Waterfall also known as “Khao Pung Waterfall”, one of the many beautiful waterfalls in Kanchanaburi Province. At the site of Sai Yok Waterfall you will also find an exhibit of a steam train that was used in the Second World War. On weekends the waterfall gets very busy as it is a popular spot for both tourists and locals alike. Other historical attractions that you may want to include in your holiday plans in Kanchanaburi is the Thai Burma Railway Centre which is located opposite Kanchanaburi War Cemetery. The museum traces the history of the construction of the Death Railway to Burma using interactive models, artifacts and photographs. Entry fee to the Thai Burma Railway Centre is 100 baht per adult and 50 Baht per child. Ensure to incorporate your tour of the museum with a visit to the Kanchanaburi War Cemetery where you will find the graves of Australian, Dutch and British prisoners of war who lost their lives during the construction of the Death Railway. The JEATH Museum is also interesting, here you can see artifact from WW II, including weapons, tools, uniforms and many photographs that belong to the prisoners of war. Entry Fee to the Jeath Museum is 40 baht. You can take a day trip from Bangkok to Kanchanaburi either by train, bus or with a group tour to explore the Death Railway and the Bridge on the River Kwai, Hellfire Pass and the other historical sites. However, as there are so many other things to do and see in Kanchanaburi you really need to spend at least 3 nights in one of the resorts or budget hotels, to be able see and do everything. Some of the other attractions we seen and experienced during our holiday in Kanchanaburi included elephant trekking, a visit to the controversial Tiger Temple and the somewhat adventurous trek to the top of Erawan Waterfalls. 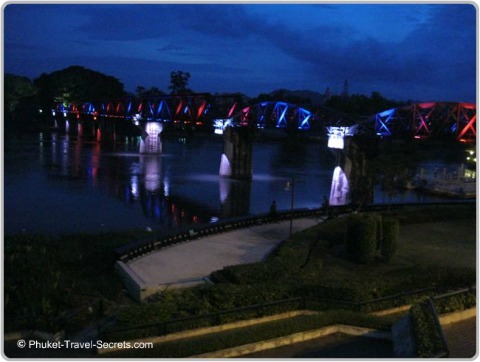 As an added bonus of spending a couple of nights in Kanchanaburi you will also get to see the nightly light display on the infamous Bridge at night. The best place to see the bridge at night is from the floating restaurants that are located just near the bridge.